The second day of our 52nd Annual I & WEMRC Exhibition. The first day of our 52nd Annual I & WEMRC Exhibition. This was our fifth and, alas, final Steam Day of the 2007 season. 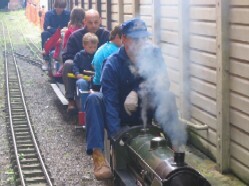 It was probably our busiest ever, with well over 100 rides, and full trains for most of the morning and early afternoon. 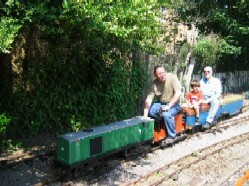 Thank you to the visitor who kindly gave us a donation of £5 in appreciation of the club and the miniature railway. The club's 7¼" Gauge Section would like to thank all those members of other sections who regularly turn out to lend a hand on Steam Days. 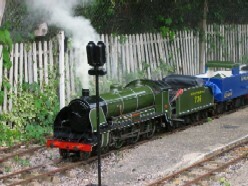 This was our fourth Steam Day of the 2007 season, and by far the hottest! It was also one of our busiest, with very nearly 100 individual rides given. Our special thanks to the anonymous visitor who very generously gave us a £20 donation towards the running and upkeep of the railway. Much appreciated! The day had the look of a 'Wimbledon' day early on, and it began to look doubtful that we'd have any visitors at all, but it stayed mostly rain free and the usual fun was was had! Layouts photos from the 2007 Chatham Show. Fine weather for our second Steam Day of 2007. Bit of a slow start in terms of visitors, but picked up later in the day. Appointment of Alan Waredraper as Honorary Chairman, with thanks to Don Neighbour for his year in the job. Appointment of Tony Spencer as Chairman Elect. Appointment of Peter Pulham as Honorary President, with many thanks to Frank Roberts for his 5 year stint, who now takes the role of Honorary Vice President. All other officials and section heads are happy to remain in their current roles for the coming year. This year's Hugh Gwyther Trophy (named after a long-standing late I & WEMRC member) was presented to Ken Mayor (Live Steam and N Gauge) for his contributions to both sections, in particular his tireless work as part of the team overhauling Excalibur, our 7¼" steam locomotive, in preparation for this year's Steam Days. The departure of Derek Lawrence from the club, who moved to Jersey earlier this year, unfortunately signals the end of the Hornby Dublo section (just when the layout had been completed, and he's arranged to take it with him!!!). We hear that Derek has already joined the Jersey Model Railway Club and wish him well. We hope that at some point in the future we may have new like-minded enthusiasts who become members, interested in starting up another Hornby Dublo layout in the club. Please come and see us, we have some of the best club facilities available. We finally got the 2007 season underway on Sunday 06 May 2007. Excalibur performed well throughout the day thanks to the efforts of the engineering team (see photo below). May 2007 Steam Day is on! After unfortunately having to cancel our first Steam Day of the 2007 season, all is ready for Sunday 06 May 2007. Maintenance work on Excalibur is now more or less complete, and early test runs have been encouraging. 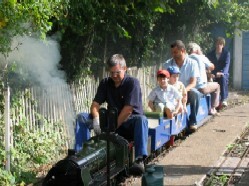 We regret that we have had to cancel our first Steam Day of 2007, scheduled for 01 April 2007. Essential maintenance work on our locomotives, particularly Excalibur, has overrun slightly and means we are unfortunately not quite ready yet to give rides to the public. 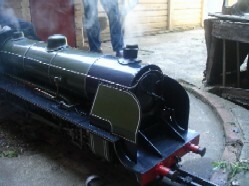 We expect to be fully up and running ready for our next scheduled Steam Day on Sunday 06 May 2007. Apologies for any disappointment!